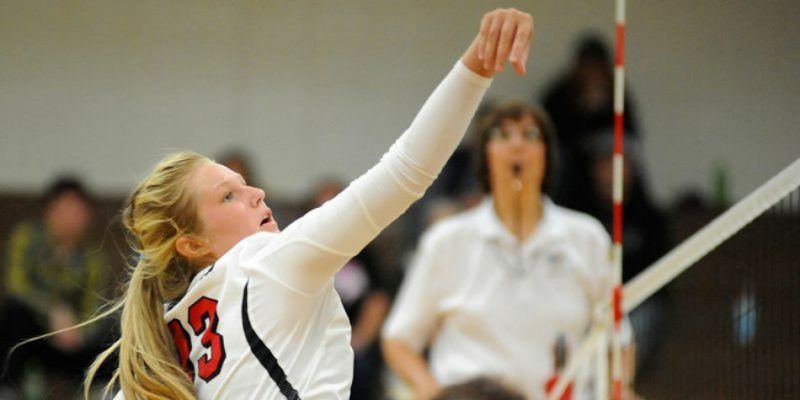 NAPPANEE – Haylee Pennington will stay close to home to play her college volleyball. Pennington, a key player for the NorthWood Red Slam program, has signed to continue her athletic career at Goshen College. Pennington was a force at the net last fall as the Panthers posted a 22-10 mark and finished as sectional runner-up to Fairfield. NorthWood went 6-1 in Northern Lakes Conference play to share the league championship with Concord. It was the first NLC title since 1997 for the Panthers. Pennington was a two-year letter winner for coach Hilary Laidig’s program. She was also a Scholar Athlete last fall. Pennington, the daughter of Scott and Leah Pennington, was one of six seniors for NorthWood during the 2017 campaign. Goshen College posted a 12-19 overall mark and finished 4-14 in the Crossroads League last fall with a young team with just one senior on its roster. The Maple Leafs’ 2017 team also included former area players Tessa Clark and Darienne Maust of Bethany Christian and Taylor Eash of Westview. Jim Routhier completed his ninth season as the GC coach in 2017. Routhier previously coached at Concord for 22 years.